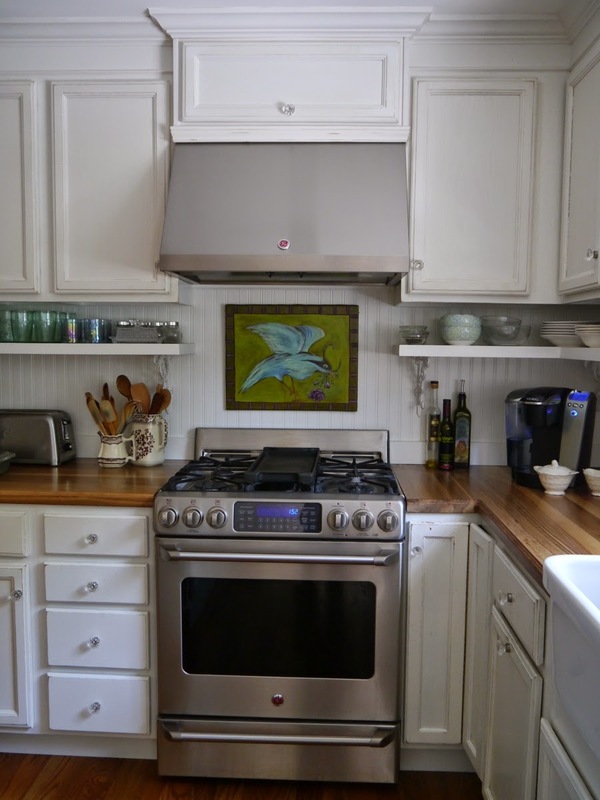 Cynthia Cranes Art and Gardening Goodness: Part 2: My Dated Ranch Home Kitchen Gets Some Fresh New Cottage Style! 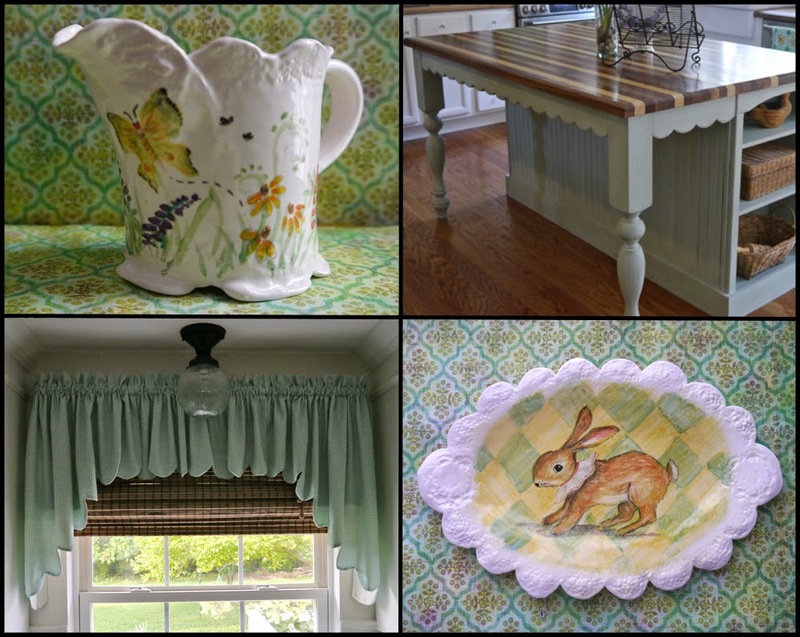 Part 2: My Dated Ranch Home Kitchen Gets Some Fresh New Cottage Style! 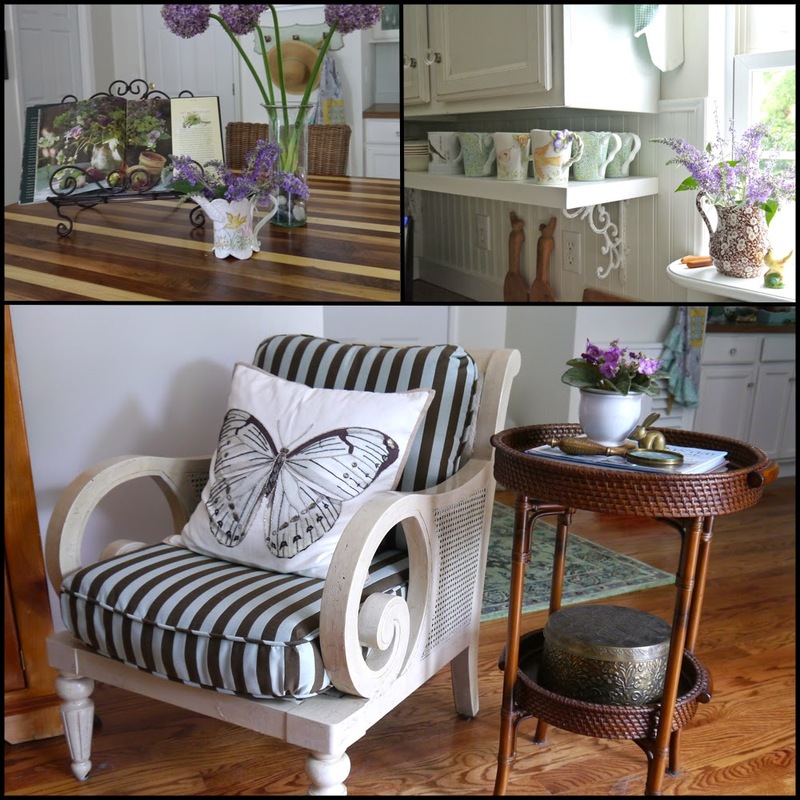 - those special flourishes I used to create the cottage charm that I love. Many of our design decisions were made because our home had no architectural detail whatsoever and has only an 8 foot ceiling height. Throughout this post, when you will see this - PEARL - you will find little "pearls" of wisdom. I'll start roughly from the beginning of the renovation and take you right down through to the very last detail. We removed a few walls and the bulkheads above the cabinets. Then we had a LOT of wallpaper to remove. Ugh! The vinyl flooring and all of the carpet in the entire house was also removed. The walls were then painted with Valspar Signature Paint & Primer (eggshell finish) tinted with Olympic color C12-1 Prairie Winds. PEARL: These rooms are fairly small, especially the family room opposite the kitchen, so by keeping the walls and ceilings some shade of white this helps to visually expand the space and raise the ceiling height. 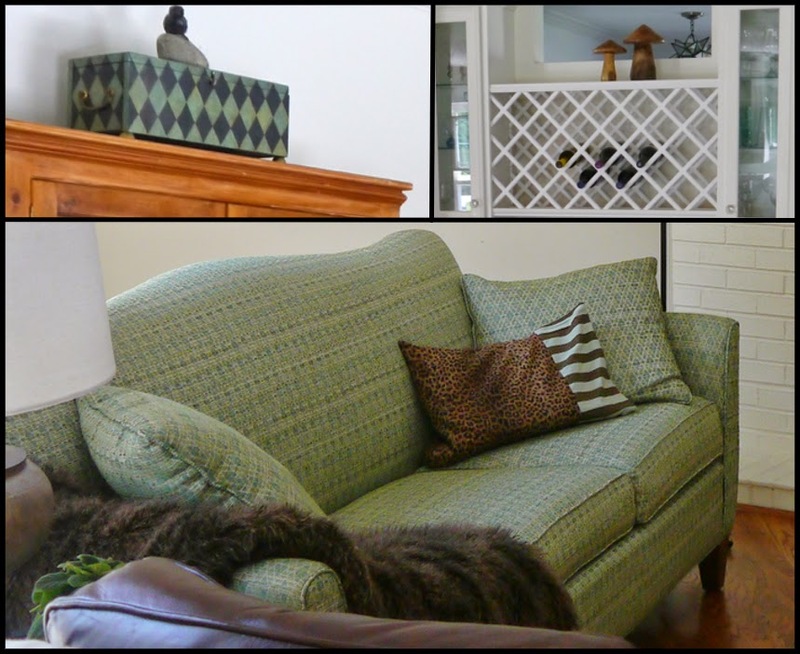 I used color in my furniture and accessories. Then all of the dark wood trim around the doors was painted with a product called Cabinet Coat. 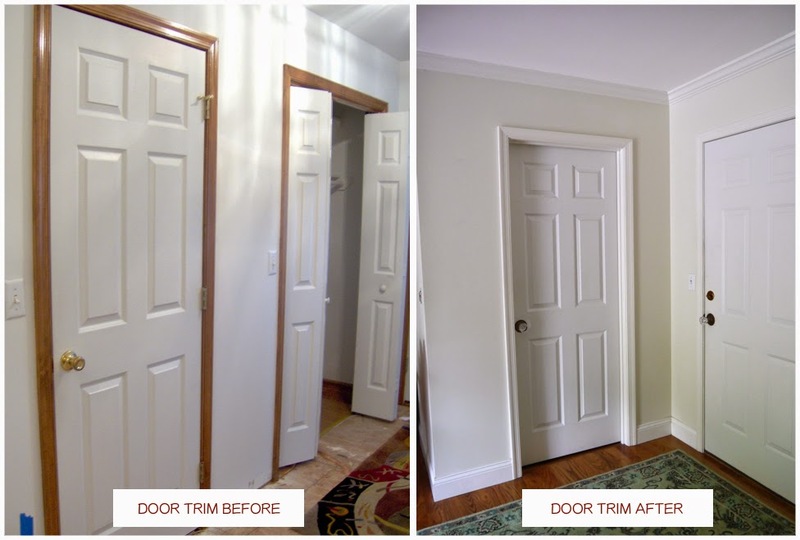 I used a creamy white that I had matched as closely as I could to the door color. This was also the point at which the recessed and new light fixtures were installed. The Industrial Cage Pendant Lights were from ShadesofLight.com. (Their home store is in Richmond, VA so I made a trip back there to visit friends and family.) And the ceiling fixture is Cary's Mill Clear Hollophane Semi Flush from Jann Richardson at LampGoods on Etsy. Next came the installation of unfinished 3 1/4" wide long-length Middle Tennessee Red Oak Hardwood flooring throughout the home. This flooring is a slightly distressed and has fewer joints since its quite long. It was actually about the same price as many options for pre-finished wood flooring, and since we still had our apartment to escape to, solid unfinished hardwood was the obvious choice. Before the floors were stained I covered them with protective paper sheets and set up tables at the other end of the room to create a space for painting the cabinet doors. PEARL: To make this job easier, I took some of our scrap 2 x 4 lumber from the demolition and hammered 2 rows of large nails into each board and placed some small round furniture protectors over the nail neads. Then I placed the boards side-by-side running the length of the tables and used that to support the doors while I painted them. 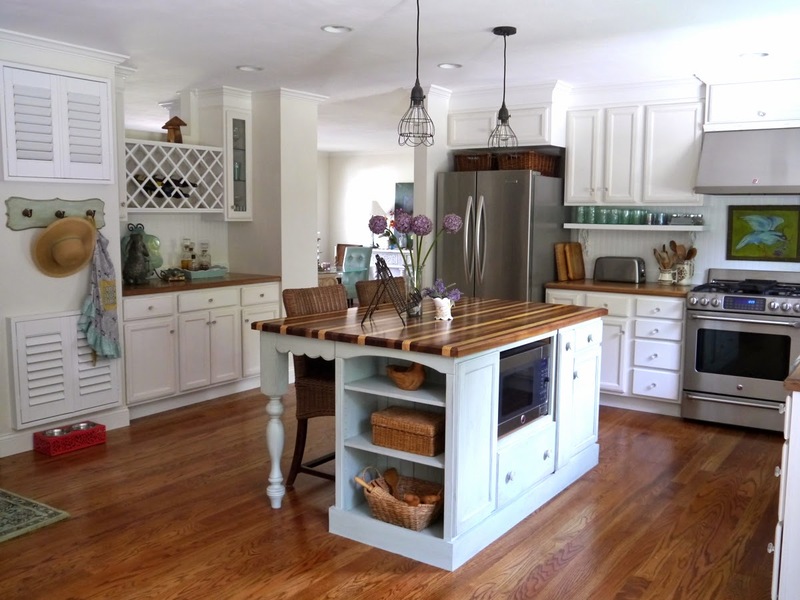 All of the cabinets were painted with the same Cabinet Coat brand paint used on the trim around the doors and then distressed them a little. We then re-installed the cabinets approximately 6 inches from the ceiling and had them trimmed out with crown molding. 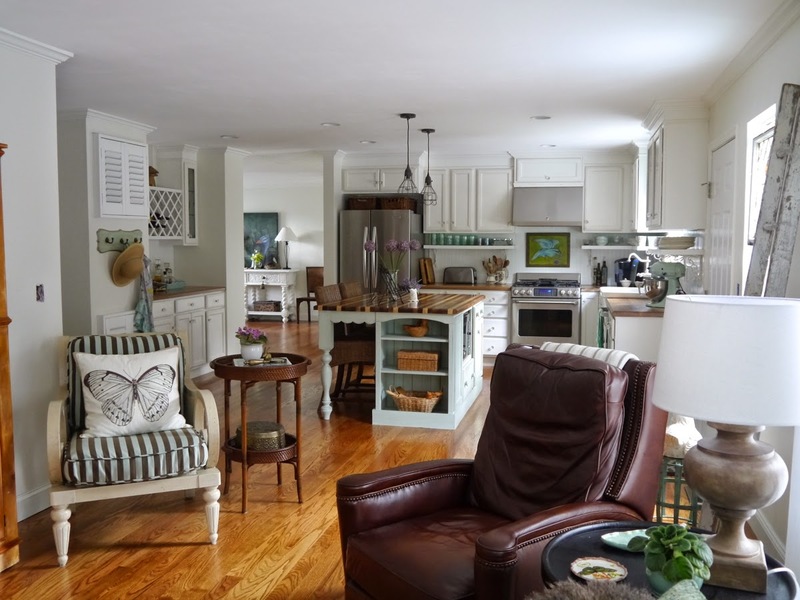 Crown molding was also installed throughout the home and painted with the Cabinet Coat. 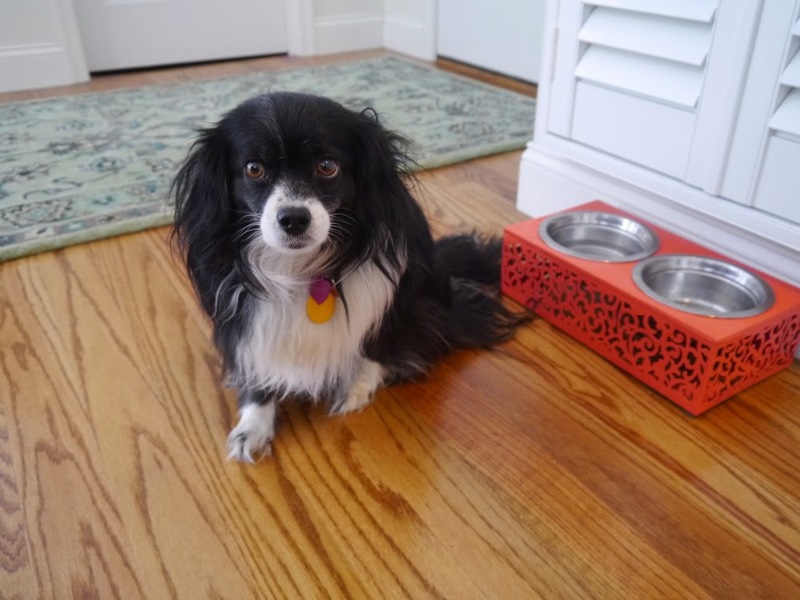 PEARL: We made and installed shelving under the cabinets since now we had 6" extra space below them. This was a much less expensive option that replacing/purchasing all new 36" cabinets. We used white laminated stock shelving from Lowes and added thin lattic strips to create a recess for under shelf lighting. The white shelf brackets are from VanDikes.com. PEARL: I think one of the best things we did to give this plain little rancher some "pizzaz" was replacing all of the door knobs with reproduction Victorian Glass Knobs, purchased from ArtDecoHardware.com. We also purchased the cabinet knobs there, keeping with the same octagon shape. 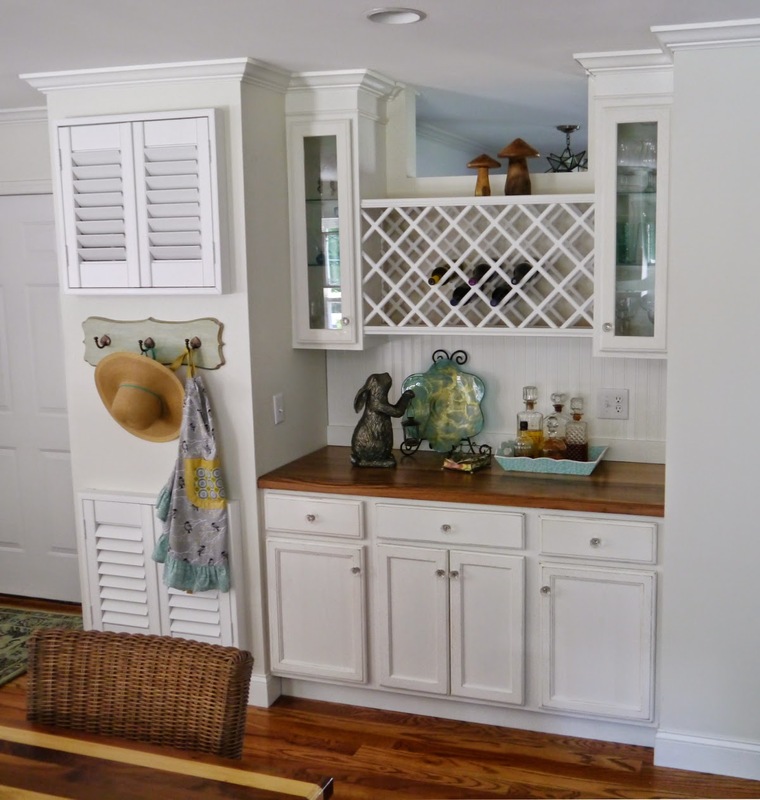 The new butler's pantry was installed on a wall we added blocking off access from the kitchen to the foyer. PEARL: To add a special design element and to allow more light into the foyer, I had my contractor create an open space at the top of the wall. Papa Crane and I made the wine rack with lattice style grids from Eclectric-ware.com. PEARL: Since the foyer previously lead to a hallway, space which is now part of the new kitchen, there were 2 large ugly HVAC returns. I had plantation shutters made to cover them. Now for a bit about specific design/decorating details. PEARL: Design experts always say its good to start with an inspiration piece, typically a rug or painting. But since I tend to do things my own way, I started with this pistachio green stand mixer - a purchase made long before the kitchen reno was complete - in order to cheer myself up. I was still feeling very homesick for my previous home, where we'd lived before my husband was transferred. I made the floral tea towel from a vintage feed sack purchased from Katey Deasy's Etsy Shop Lovethegiver. And the yellow fruit tea towel I won in a blog giveaway from Deb and Kathy over at Secondhandroses. PEARL: It is a good idea to repeat shapes or designs in a space. So since I really like diamond or lattice patterns I included them in several places. A daring move, this diamond patterned sofa! I also like stripes - and don't forget beadboard paneling - that's a stripe, too! but MOST of all - I LOVE scalloped designs! But perhaps my very favorite of all - very cottage-y scallop-edged designs! This brings us to the very last detail of my new kitchen - the window treatment. I chose the bamboo shade, inexpensively purchased from Lowes, and topped it with a scallop-edged fabric valance I made with help from Spencer's Easy Peasy Scallop Tutorial over at Bellamere Cottage. I was very intimidated about making the valance, but her tutorial was fantastic! Thank you Spencer! 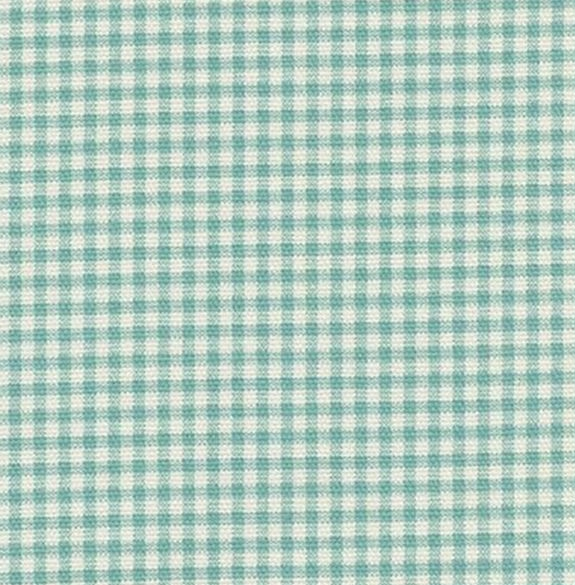 The fabric is Waverly Gingham Check, color 'Pool' purchased from FashionFabricsClub.com. Gosh, y'all, I could go on and on but this post is probably already too long! I'll post again later with more details on how we made the kitchen island. But my next post will be for the Around the World Blog Hop. I have a special surprise for that post so be sure to come back now, ya hear? And if you'd like to participate, just shoot me an email or comment below and I'll get right back to you with the particulars. Hope you've come away with some good ideas today! What a great post Cindy. The details of your kitchen remodel are fantastic. 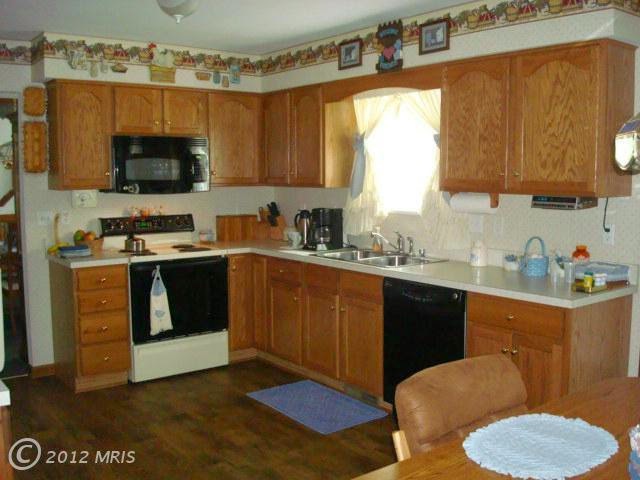 I love your kitchen and the color scheme is very soothing to me. Everything looks so pretty and fresh. Love all that you did. I need a kitchen!! ..your kitchen remodel are fantastic...and beautiful! Wow, Cynthia! 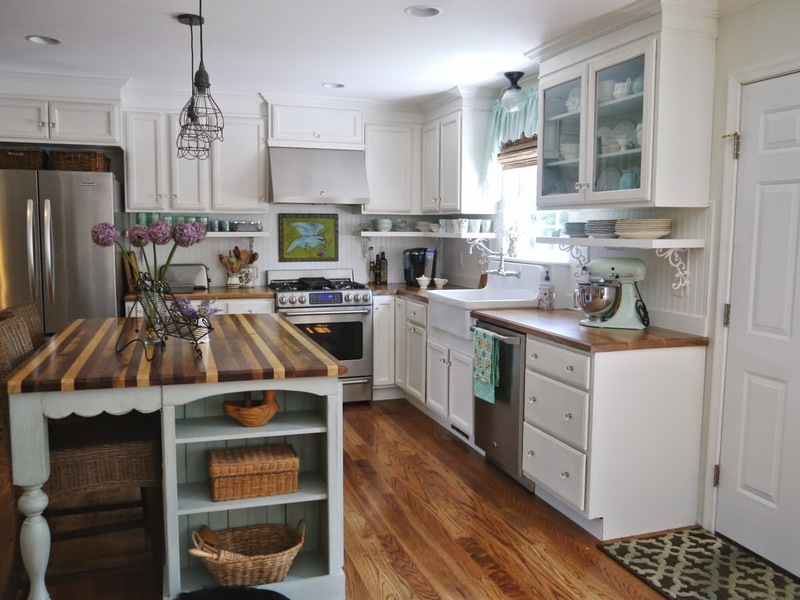 What a gorgeous cottage kitchen! Beautiful and SO well done! I love the airy and friendly feeling it has. Thank you for all the info, too. I love crystal doorknobs. That was a great idea! Oh my STARS! That is almost EXACTLY what I want for my kitchen/family room remodel. You make me almost brave enough to paint my cabinets, which I was thinking was out of my skill level. I just bought a used hutch and I've primed it and bought glass knobs for it. It wasn't as hard of a job as I thought. You remind me to take more pictures though! Very wonderful inspirations, thank you! Beautiful! 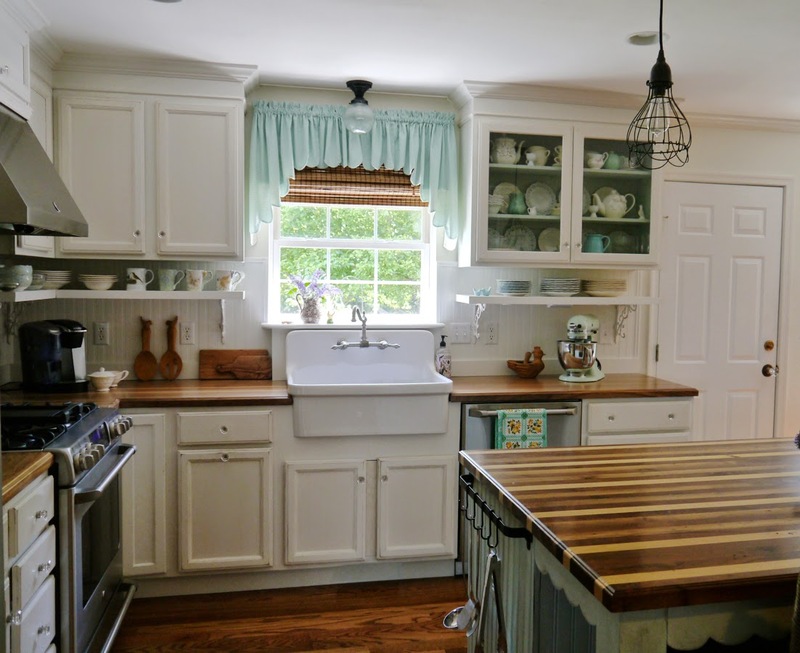 I especially noticed the farmhouse sink, a favorite style! Beautiful . . . Simply Beautiful!! You have a great eye for design! We also live in a ranch style home "on the mountain" that we have s-l-o-w-l-y been fixing up. Cynthia!!! Oh my goodness, what a chance!! This new kitschen is absolutely adorable! Fantastic work with a perfect hand for colours and decorations!